At InfoComm 2016, JBL introduced the Control 80 Series Landscape Loudspeakers. The Control 80 Series features two highly weather-resistant models, engineered to provide full-range sound quality and 360-degree coverage. Designed to be mounted on or in the ground, the Control 80 Series can be used in a wide variety of applications, including shopping malls, theme parks, sports venues, hotels, casinos, resorts, restaurants, hospitality, entrance ways, leisure venues, and anywhere a music and/or paging landscape loudspeaker is required. Compact in design, the Control 80 Series loudspeakers are unobtrusive and easily blend in with their surroundings. Both models are IP56-certified with polyethylene enclosures that resist abuse from the elements. The enclosure color extends throughout the material, so the speaker will maintain its color even when scraped or scratched. A built-in transformer allows use on 70V or 100V distributed systems, or can be set to 8 ohms for low-impedance operation with an easy-to-access tap selector. Available in two configurations, the smaller JBL Control 85M is a two-way speaker system, featuring a highly weather-resistant 5.25-inch low frequency driver and 0.75-inch tweeter. The 85M provides 80 watts of continuous pink noise power handling (320 watts continuous peak) in the direct 8 ohm setting, plus has a built-in 30 watt 70V/100V multi-tap transformer. 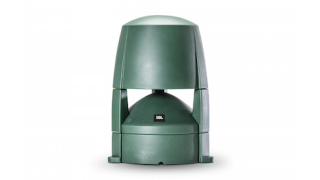 The 85M features a high-fidelity sound character with a broad frequency range of 55 Hz–18 kHz. The larger Control 88M features a highly weather-resistant 8-inch driver and 1-inch tweeter, providing 120 watts of continuous pink noise power handling (480 watts continuous peak) in the direct 8 ohm setting, plus a built-in 60 watt 70V/100V multi-tap transformer. The 88M features an extended bass response with a broad frequency range of 47 Hz – 16 kHz. Both models feature SonicGuard overload protection for preventing damage from occasional overdriving.